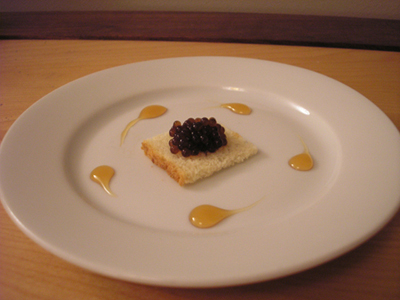 I've been experimenting with a technique that gels liquids instantaneously and at room temperature to create espresso "caviar." The espresso is encapsulated inside itself and it bursts in the mouth, much like real caviar. This is my interpretation of the traditional Spanish breakfast of coffee and toast.